The Purple Caravan: Empty birdcages for me. Birds are one of my most favorite creatures. Their grace and tenderness, their strength and fascinating peculiarities, and above all, their song. 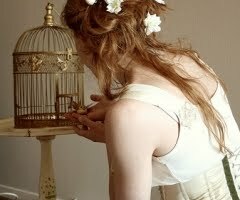 As a young child, I loved fairytales of princesses who were serenated by their feathered friends. During our first year of marriage my husband (ever so indulging) gave me a couple of Love Birds. They were so beautiful! Soon after, guilt showed up. Our birds were clean, well fed, loved, but every afternoon when I returned from work there they were: in a cage. In spite of myself, and because I loved them so, I started to imagine what they would tell me if they could speak. I was secretly tormented until I finally decided they had to go. Arrangements were made and we gave our birds to someone else. It took a while for me to realize that this personal abhorrer of birds in cages stems from personal past experiences. I was emotionally stiffled and controlled for years, living in a beautiful, clean "cage" performing boring duties, doing imposed chores, always trying to please others while constantly being aware of an outside world I could not reach and enjoy. Oh, I do know what is like! Super-lovely post.. and very powerful insights! Nice to know a fellow bird kindred!